Comments: The modern Super is identical to the Concert with the exception of speakers and cab size. Is this one of the Fender amps that is considered to have a lot of “Touch Sensitivity”? I bought mine used about 4 years ago.It is one of the best amps made at the time ,in my opinion . It is my keeper.Love it much but it is hard to find any information on it.I’m glad to have found your site. It is nice to have a quality but sort of rare amp. i have owned two of these amps, still have one. 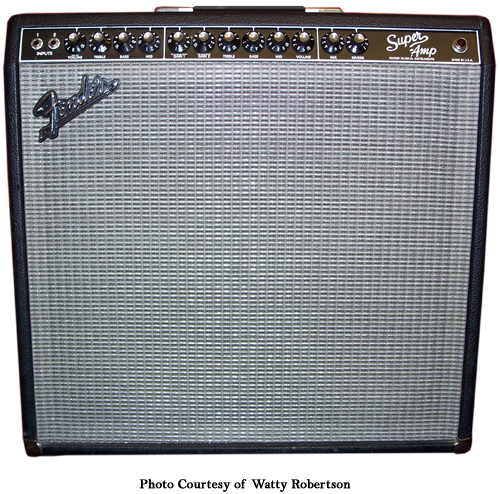 they are a spin-off of the 1982-87 concert series amps.fender added an extra switchable gain stage on channel two, on the super pro series. you can contact fender and they will e-mail a schematic on just about any fender amp that you cannot get information on. these amps sound good with J/J power and preamp tubes. hope the info was helpful. ENJOY. I just got one of these yesterday. Its mint and sat in a bedroom for 17 years. Tags still on it! The drive channels are very mild, but I got it for the cleans. I may try an overdrive pedal today in fx loop. I plan to find a nice blues sound with it, it shouldnt be too hard. I plan to swap the overdrive tube with a tungsol, which should be a little dirtier than the original. This should be a good starting point. I played it for about 5 minutes when I brought it home. Im impressed. I’ll be trying different guitars tonight, a les paul, a vintage sg, an esp viper, a esp ltd horizon, and a george lynch flame baritone. Seymour Duncan and Dimarzios throughout. I purchased this amp last week. played a gig last night. fantastic powerful amp. real nice fender tones. Distortion needs some some help. you mentioned changing the tubes for the overdrive. did you notice any improvment, and what tubes did you install. Way to many tubes to choose from. I am not up to starting a collection. I have a 1995 edition of the Super Amp and have used it for recording and live performance. It is one of the cleanest, deepest and chimey sounding Fenders I have heard from the reissue stable of hand-wired, tube amps. It can sound nice and dirty too. I must say I really don’t like their solid state amps with “modeling” as they tend to sound “dry” and “brittle” to my ears. In contrast, this Super Amp (with Reverb, channel switching and master volume controls) is more versitile and useful in a variety of playing situations (quiet jazzy, digging into the blues like Robben Ford or Larry Carlton, or something in-between). Compared with later Fender Super Reverb amps that they have reissued in the past few years…this is better sounding in my opinion. Thanks for reading…Peace. I have been looking for a Fender amp to gig out with, and now I have finally found it. This Super Amp has got the volume and versatility for the country, blues, and southern rock that I play. Each of its three channels has something different and good sounding to offer. Even though it has a solid state rectifier, I am amazed at how similar the basic clean channel sounds, compared to my old Deluxe Reverb and Bandmaster Reverb, which both have tube rectifiers.Sounds great with a Strat or an SG. The low end with a 335 or Les Paul needs a little rolling off. Haven’t tried the Tele yet. The two over drive channels step it up a notch with very interesting overtones. The footswitch makes channel switching a breeze, and I just love the sound of the 4 x 10’s. While it is certainly no vintage mid 60’s era Blackfaced Super Reverb,with all of its great tone…for the money, this is an excellent value, with versatility between, Fender clean and their take on two different overdrive voicings. With some tweaking, and upgrading the tubes, this is a very fine sounding amplifier, with plenty of power and projection. I have one of these amps, and would like to upgrade the tubes do some tweaking. Could you help or pass on any recommendations? I got one (a 1994) from the Charlotte Guitar Center earlier this evening and other than a non functioning reverb (bad tank) this amplifier has just blown me away. this is now my #1 go-to amplifier. the power is low enough that i can still use it to jam with friends in the living room but i can play a decent sized venue without having to mic it. it starts to break up around 5-6 on the volume but by then it’s loud enough to sterilize an unprotected man. great amp for an amazing price from a great group of guys at the Charlotte (matthews) Guitar Center. I’ve had one of these amps since 94. Hasn’t had a lot of use but is the largest of my blackface style Fenders (I currently also own a 65 DRRI and a Princeton Reverb 11). Still running the original tubes! It certainly is a versatile amp, from home practice (that won’t annoy the neighbours) to playing with a five piece band. One hiccup: a LED diode in the footswitch became loose about three years ago so channel switching was not active. Just ran the soldering iron over the tracks and all was good again. For those of you without copies of the manual or schematic note that the volumes and tones are before the effects mix control, which is before the reverb section. So if your reverb sounds a bit hissy at low volumes that’s kind of like the old blackface models without a master volume right before the power amp section – you learn to live with it. The design was adapted for the Hot Rod series. The power amp design came in for a bit of criticism because there isn’t a pot to adjust the bias; I think you’ll find the 62-63 Concerts were the same and I’ve seen two of them in almost pristine condition still running perfectly. Get a good tech. If you need a schematic then use the keywords “93 Super Concert Schem” and you should find a number of PDFs online, around 880kb in size. Good luck and enjoy your amp as I have with mine. So when you change tubes it adjusts to a default bias setting? i thought these were identical to the concert amplifier except for the speakers……4×10 in the super and 2×12 in the concert BUT i see that it says the super is fixed adjustable bias and the concert is just plain fixed bias. are they different OR are they both fixed or both fixed adjustable? it means a 160 mile round trip to drop the amplifier off then another 160 mile trip to pick it up since the closest tech that can be trusted is in Charlotte NC while I’m in Columbia SC. i need to retube but it means either retubing myself if i dont have to touch the bias or letting it sit for 4 or 5 months until i can get up to Charlotte. Hello, I have a problem with my reverb which doesn’t functionate. Please, someone can help myself; thank you! I have a 1993 Concert and a 1990 Super Amp. Beautiful sounding. Reverb went bad on both. Replaced the RCA cable on the concert… fixed it. BTW: using a higher quality reverb cable made the whole amp less buzzy. Repaired the Super Amp by replacing both the reverb cable and the reverb tank. Note: you can plug the reverb tank from one amp into a different amp to test it. tubes in 2005 and 2010 – and the amp delivers everytime ! he recognized that “it looked like new – without any sign of wear” …! In 23 years the amp never let me down – what more can be said ! I invested in a Weber Mass Attenuator to go between the amp and its speakers. The speaker connection cable is short at about thirteen inches; Fender do have a suitable replacement that is about thirty inches long. I had to order it from a Fender dealer but was happy with the price. There used to be a number of manufacturers that made this type of cable: 1/4″ to spade lugs. However, from about 2015 on the alternative replacement cables seem to have been dropped. You can make your own, but you have to find suitable sized spade lugs as they can range from about .185inch to about .215inch or thereabouts. I believe .205inch is supposed to be a reasonable compromise but you should do your own measuring to be sure. Why run an attenuator? Because the Master Volume on the FMI93 Super and Concert does not operate on all channels; and you have the effects loop and then reverb after the volume controls. Both the effects loop and reverb run better with hotter signals. Therefore, if you want to quiet things down on all channels you can either run a volume control in the effects loop or run an attenuator after the power amp. I have tried both and prefer the attenuator after the power amp. This is not an amp for hi-gain or breakup: its beauty is its ability to stay clean at all volumes. Hi, do you think it is a suitable amp for home use or will it be way too loud? I don’t mind if it doesn’t sound great, as long as it sounds kinda good at low volume. 2 Reverb knobs instead of Mix??? Footswitching between “Albatross” and “Master Of Puppets”? Anyhow, enjoy their sound but beware: repairs are nightmare. One amp builder/ fixer from here Chicago told me it’s like being a surgeon of a stage 4 cancer patient: cut him open, look inside, sew him up. Inside chassis is one giant pcb, end to end. It’s solder side up and the components dangle. BTW, Christopher from Germany, that’s the reason your tech could honestly tell you there’s no sign of dirt and wear, but he could have determined it just with a small mirror. All the worst scenarios included in disassembly job: short wires, breaking like glass, bunch of different screw and washer sizes, potentiometers ejecting their shafts like a lizard its tail when you try to push them free from the front panel; some tube sockets on pcb, others on chassis – their connecting wires, as mentioned above, break like glass. Even if, by miracle, main pcb, pots and chassis – mounted tube sockets are removed entirely from the chassis – THERE IS NO WAY TO CONNECT THEM TOGETHER ON THE BENCH TO FIRE IT UP FOR TESTING !!! No parts description on pcb. Again: no parts numbers silkscreened on pcb. And there are differences between schematic and the real thing. Yes, bias is fixed – by a single resistor. Solder pads of that resistor and of surrounding area parts are covered by a thick layer of epoxy-like glue and piece of foam. If someone wants to install a bias pot and is careless with chiseling off that glue – gone are the traces from pcb. Easily the bench fee for disassembly/ putting it all together alone could be like 1/3 of the amp’s market value. That perfect sized, beautiful on the outside blackface box is, sadly, a disposable POS inside. That explains one of the shortest production runs of Fender amps. As they say in beer commercials: enjoy responsibly. Cheers! This is clearly a very old thread, but I’m hoping somebody out there can assist me. I just purchased a Pro Tube Series Fender Super. I am amazed by the clean tone – I’ve never had an amp sound this good. The gain channels are definitely usable (I play blues/rock), but unfortunately it didn’t come with the foot switch. Any ideas on getting one? Fender part #: 099-4064-000 Roc Pro/ performer 1000/Concert/ Super. Will a vintage Super Reverb chassis fit in the Pro tube series super cabinet? I can’t find consistent and credible dimensions of either any where. My 1993 Super Amp that I bought new in 1994 has given up the ghost. Two amp techs have told me the same scenario as posted by Adam. So if I can I will slip in a vintage chassis and move along.